Art has been a big part of Laura Ashbrenner’s life since age 12, when she designed clothing for paper dolls. 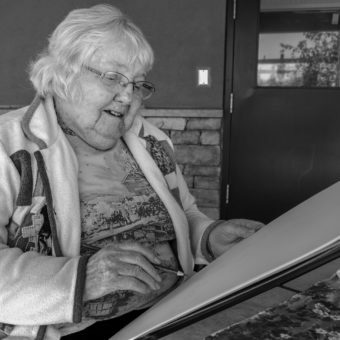 She still paints today at age 104. Though Laura Ashbrenner’s hands have weathered 104 autumns, they are light and sure as the faint lines of a barn and a mountain take shape on her sketch pad. 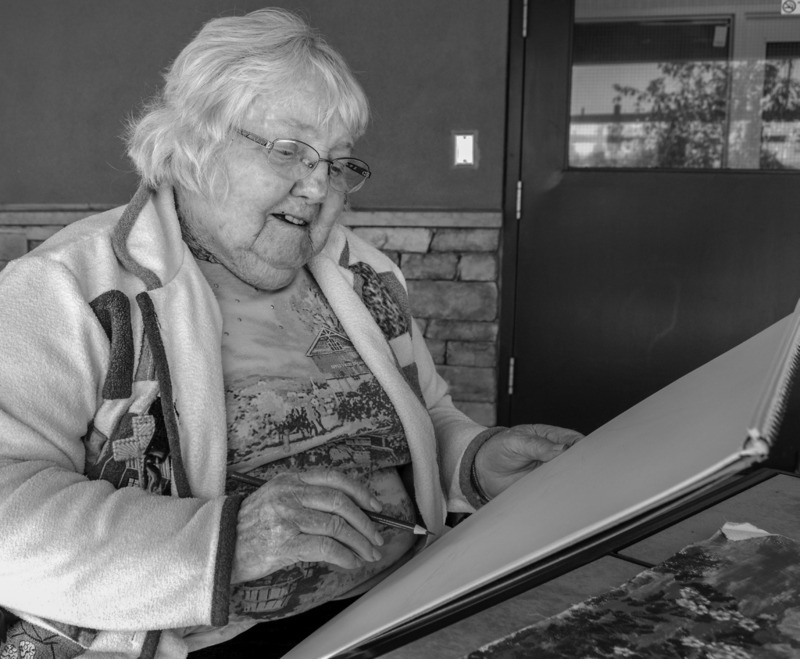 Art has been Laura’s constant companion throughout most of those 104 years. 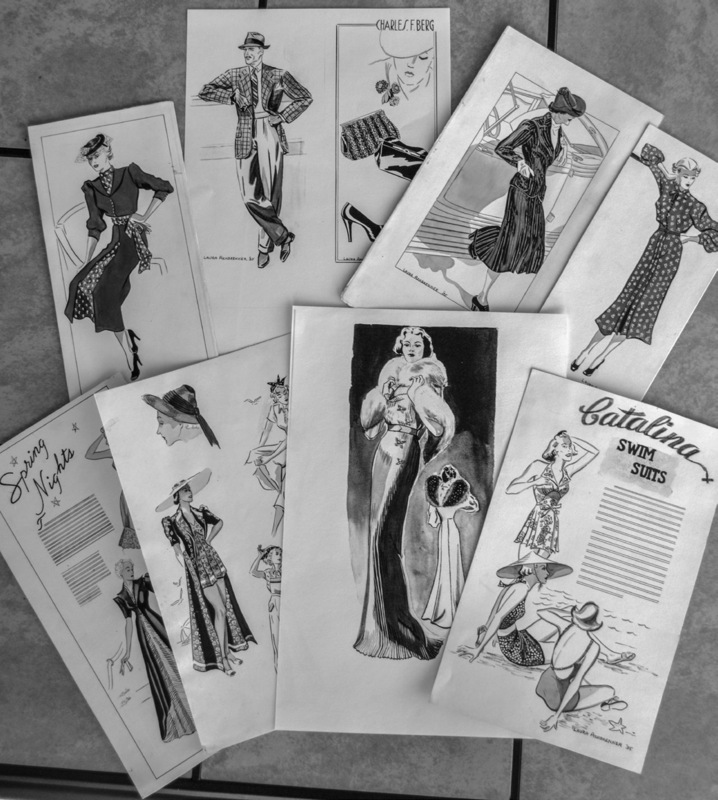 “My cousins got me started drawing dresses for paper dolls,” she says, chatting on the patio at Columbia Basin Care Center, where she now lives. Laura was born in a cabin in Battle Ground, Washington. She started drawing at age 12. By age 14, she was painting with oils, thanks to a birthday present from her family. After graduating from Battle Ground High School, Laura took art classes at Clark College in Vancouver, Washington. “They didn’t have what I wanted, so I went to art school in Portland,” she says. Laura studied commercial art at the Oregon School of Fine Arts, then studied under fashion artist Carolyn Reis. Laura made her living working for the Adolph L. Black Advertising Agency. She drew fashion art as a freelance artist for Meier and Frank and several other companies. 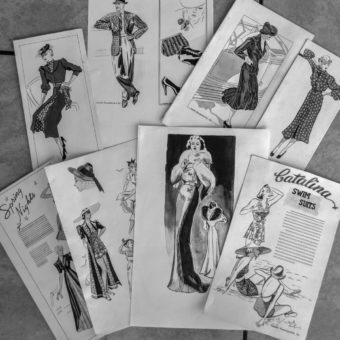 Representative of the 1930s, Laura’s ink drawings feature elegant, long-limbed women in crisply tailored suits, revealing lingerie, flowing day dresses and glamorous evening gowns. Graceful, long-limbed women in crisp suits and elegant evening gowns are among Laura’s creations. She worked as a fashion illustrator for many large clothing stores in the 1930s. Laura’s life and her career changed in 1937. A few years earlier, she had met her future husband, Edgar, at a barn dance while both were on dates with other people. It was during the Great Depression, and Edgar had to find a job before he could support a family. They couple married in 1937, and Laura moved away from her big-city career to tiny Wishram, Washington, where Edgar worked for the railroad as a machinist. They were married just shy of 76 years, until Edgar’s death in 2013 at age 105. Laura continued to practice her art while she and Edgar raised their three children, Vernon, Janet and Marcene. She developed an interest in ceramics and learned from Bend artist Leona Wilde, who had moved to Wishram. Laura and five other women bought a kiln, molds and paints, and enjoyed working on ceramics together. With her background in drawing and painting, the others often asked Laura to paint the faces on their figurines. Soon she had her own ceramic class and taught for about 43 years while living in Wishram and The Dalles. When Laura and Edgar moved to The Dalles in 1957, he built a two-bedroom home, as well as an artist’s workshop. “A lot of ladies came to do ceramics with me,” Laura says. She would drive into Portland every week to buy greenware, selling the unfinished pieces to her class members. While her cherubic face and artistic nature might make some think she has a soft disposition, Laura was no-nonsense in her business dealings. She is fond of telling the story of a client who refused to pay her bill. Eventually, the woman moved to Canada. As she ran the ceramics shop, she also continued to paint. 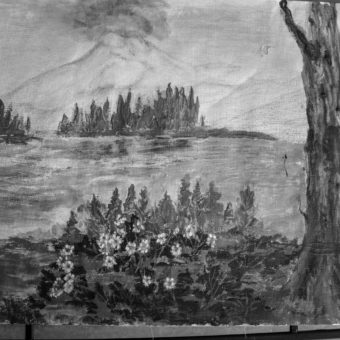 Sitting in front of her as she talks is a landscape of Mount St. Helens that she painted just days before. 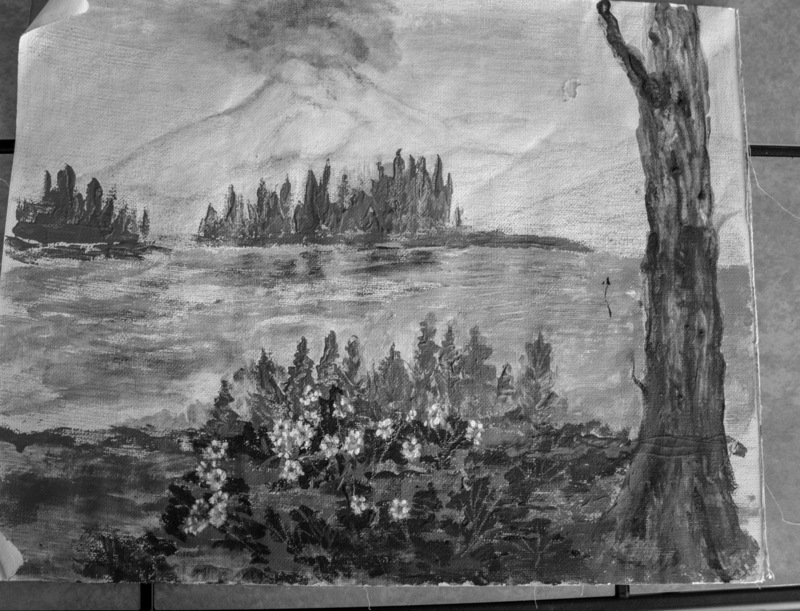 A painting of Mount St. Helens erupting, painted earlier this year, is planned for a gift. “It’s a Christmas present for my son,” she says. Throughout the years, Laura’s paintings have been featured in many venues. She and Edgar used to set up a sales display at Lloyd Center in Portland. Her works were also a regular feature at The Dalles Art Center. They continue to be displayed at the Columbia Gorge Discovery Center’s gift shop. “She just got a check not very long ago from a sale,” says her daughter, Janet Meader. While Janet says she did not inherit Laura’s artistic bent, her sister, Marcene, is an artist. Unlike her mother’s preference for landscapes, Marcene enjoys portraiture. Barns are a favorite subject for Laura. Their travels also included trips to Europe, Mexico, Hawaii, Canada and the Virgin Islands. After reading that a wife should be involved in a husband’s interests, Laura joined Edgar on his fishing trips. She would paint while he fished. It was a system that Laura says served them well through the years. Laura’s mind remains sharp, despite her advancing years. Her answer is ready when she is asked her secret to long life. “Having something you love to do keeps you alive,” she says.